The Adrenalin 'PP' thermal rashies are some of the most comfortable, versatile and durable. From spearfishing, to scuba diving and even surfing, the Adrenalin 'PP' thermal rashie is sure to keep you warm and protected from the sun. 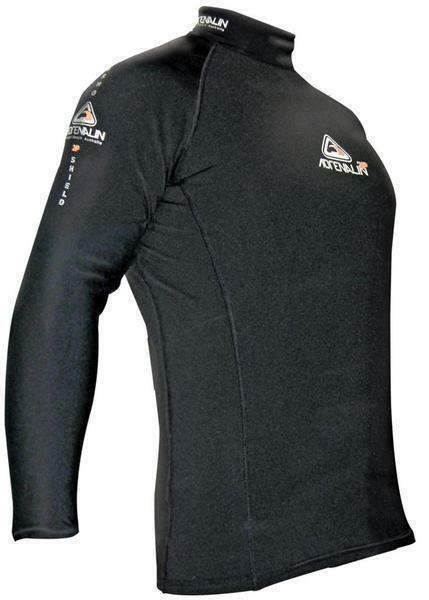 This long sleeve top is perfect to wear under a dive suit for superior insulation, under fishing clothes for extra warmth on the water in the early mornings or for an endless range of sporting applications, including surfing, kayaking, yatching, climbing and snow sports. Great for Under Graments - extra warmth for Winter. >Flat lock stiching for no Rashing. >Highly effective agaisnt Wind Chill. >Acts like a Second Skin. >Superstretch + Fleece for Comfort.